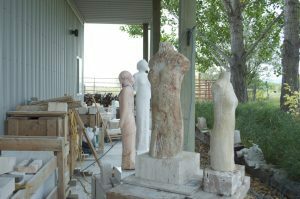 I have been busy this summer working on travertine sculpture. 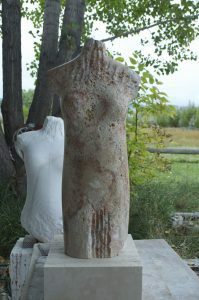 This textured stone brings an ancient feel to the sculpture that I like. When I polish this travertine, the color gets more intense and gives a nice contrast to the texture. The pink travertine is Scabus travertine and the beige is called Travertine Classico both from quarries in Serre di Rapolano, Italy. Torso Twilight is in the background of this photo.